A month in and the new SEN system is still an unknown quantity for many schools. SENCos are still getting to grips with what will replace the IEP and are thinking about the first transfers from Statements to Education, Health and Care Plans. The DfE says a transfer must not be a simple change in the name at the top of the paper and further assessments may need to be carried out so that every part of the new plan can satisfactorily be filled in. Yes, it starts with parents. You can't co-produce without them and, for those 16+ years, with the young people too. For those children under 16, they are also expected to be an integral part of the process if they are able, and given every assistance to be involved so their voices are heard too. But this is new territory for most parents and teachers and as this is new and there are no fixed ways of doing this, we are going to suggest a few ways you might want to consider. Host a parents' coffee morning to meet all the SEN parents on an informal basis – give them a quick presentation about the changes and then invite them to take away a model One Page Profile sheet so they can work with their child on building up their own. 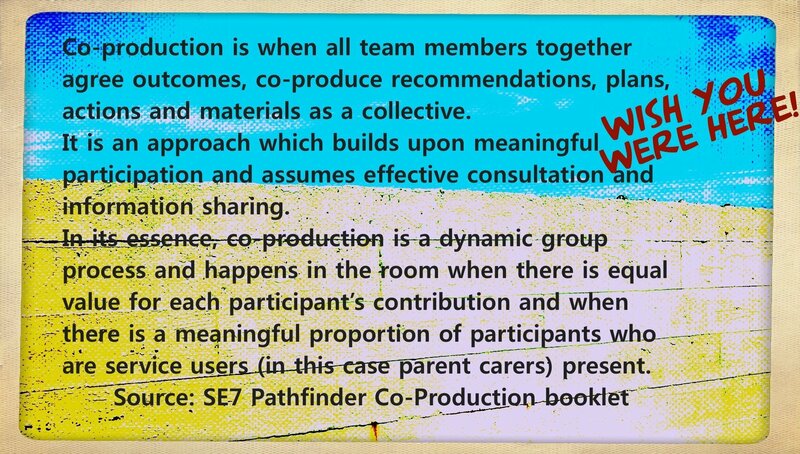 Explain what co-production means. Invite each parent to make an appointment at a later date to discuss the child's One Page Profile they've been working on. Invite the child as well and the class teacher and TA if one works regularly with the child. Make sure you have a record of and are familiar with all the existing support. You could send a copy home before the meeting to give the family time to discuss it beforehand. Remember, many parents find these meetings stressful and forget to ask the questions they need to. Make sure they know they can phone or email in follow-up questions. Reassure them that their child's statement, if they have one, is still valid until it becomes an EHCP and their child will NOT lose any support because of the change over. Make sure that you don't miss out any parents who couldn't make the session – even the ones you might think won't be interested. You might be surprised how people react to being empowered. Remember, the government says this is not a cost cutting exercise, despite what your local authority may tell you. Give the family the link to the new parents' guide to the Code of Practice as a starting point and print off our SNJ New SEND System Flow Charts . Be ready to answer questions or give them links to find more. At the meeting ask the parent and the child what they feel is working and what isn't – this may be the first time you have had an opportunity to discuss this. Ask for their ideas as well but have some other evidence-based interventions that you could try. How certain are you that you fully understand the child's difficulties? The first part of the Assess, Plan, Do Review process is "Assess". The Code of Practice says that Assessments by external experts must be considered up front so that teachers have a proper idea of what they're dealing with. Have they ever been assessed by an SLT/OT/Autism outreach/EP? Consider if this would help you deliver a more targeted and effective strategy, particularly if the child has been on the SEN register for some time. It is no longer acceptable to let them stay there for years (if it ever was) without sufficient progress being made. If this is the case, either what you are doing isn't working or the child needs more help than you can reasonably offer and should be assessed for an EHCP. There is no set number of ADPR cycles to be tried before deciding a more intense level of help is needed. Agree a plan of action with the family and a date for review. If the child already has a statement, let them know the likely date when their child will be moved over and what will happen. If the child is at a transition point, this is likely to be sooner rather than later. You should review how well the interventions in their statement are working with the family and find out if they are happy with progress – after all, this is going to be key information for the EHCP and your close involvement now will make for an easier transfer when the time comes. Record Keeping – no IEP any more but many SENCos have decided to keep the base IEP as a system of record so they can keep a track of what's been tried, what has worked and what was a non-starter. Pass on to parents any relevant information about the system changes that are passed to you from the LA in an appropriate way – via email or letter home. Perhaps put all your SEN parents on a BCC email list if they aren't already and drop them a line with new information. For those not on email, make sure you send the information home in a letter. Remember this isn't a short term change – it is a new way of working in partnership so start as you mean to go on. Interventions: Stay current. You don't have to be the SENCo to subscribe to the SENCo Forum update. Why not also subscribe to Gareth Morewood's website as well as the TES site and the Optimus SEND Hub site. Subscribe to email newsletters from as many sources of quality resources as possible and encourage your TAs to do the same. You can also subscribe to SEN Magazine, Nasen and SEN Leader Magazine. These magazines offer a wealth of up to date information that every teacher involved with SEND should have on their reading list. As part of partnership working help your parents stay up to date as well – if you find information that may be relevant to their child, why not print it off or email it to them. Never make assumptions that they already know it or that they won't be interested. Sharing knowledge is the whole raison d'être of a teacher – and that shouldn't just include the pupils. If you take the time to include the parents in their child's education in an open and welcoming way, you can quickly become a team and this can only benefit the child. Do you have any ideas or tips for good co-production? Please add them in the comments.